UCCFS: Tacos vs Fish ‘n Chips Round 1 – I Love It Spicy! Yes another Ultimate Chilehead Comfort Food Showdown first round battle. We are down to the final two matchups before we on to Round 2. Here we have #2 Tacos vs longshot #15 Fish ‘n Chips. 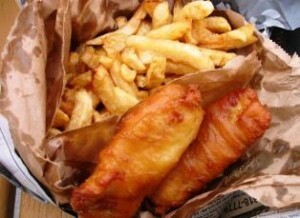 As much as I enjoy a good taco though, can it be the best fish ‘n chips? To me the fish ‘n chips relies much like the shrimp cocktail on the condiment served with it. I am a huge fan of cocktail sauce and dunk my fish ‘n chips into the stuff until the very last bite is gone. In fact, yesterday I was graced by a visit with Firehead Thomas, and what did we both eat? Fish ‘n Chips. Well truth be told Thomas had Fish ‘n Corn on the Cob. While it wasn’t the best I have eaten, it still was quite good. If you have never had a good beer-battered fish ‘n chips meal, then frankly you have never had fish ‘n chips. On the other side of the page, we have the fun food, tacos. Tacos are a food with a lot going for it. We can have it stuffed in so way different ways, and wrapped in a soft or hard shell or both if you prefer. This is a kid food that appeals to adults because we can make it our own. How many of you have made your own taco bar with fixings lined-up so your guests/family could create their own masterpiece. Some might think it is art form in the creation of their own taco, telling each other this is the way I do it. In my hard shell I use seasoned ground beef, then cheddar next so it melts a little, then garnish is with a little bit of lettuce, tomato and a touch of salsa and sour cream. Once that is assembled I splash it with CaJohn’s Oaxacan or suitable taco sauce if I run out. I grew up with a Ponderosa restaurant on Long Island and my family would go out for their brunch buffet on occasion, and I would look forward to their taco bar with their ground beef with corn. I couldn’t get enough of the stuff. I think their should be a restaurant chain that just has the taco bar. I am sure there is, but none that I have seen here on the east coast. Anyone with any stories to share? Please enlighten us with your decision making. how about Fish Tacos! Yea! I remember the Wendy’s salad/potato/taco/soup bar! It was really good! That was one thing they should have kept. Tacos are made here often. Other than just a comfort food. 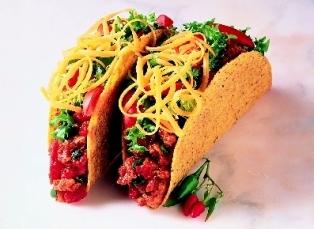 You can turn any leftover meat into taco meat. Just spice it up and turn in into a whole new dinner. Tacos with Oaxacan sauce on em! Amen I’m with Hudd. I love tacos with Oaxacan with Habaneros ! It’s sooo good u can use that sauce as taco meat seasoning itself.AWESOME STUFF! !